Western blot analysis of extracts from 293T cells, mock transfected (-) or transfected (+) with constructs expressing Myc/DDK-tagged full-length human CXCR4 wild-type protein (CXCR4-WT-Myc/DDK), Myc/DDK-tagged full-length human CXCR4 S339A protein (CXCR4-S339A-Myc/DDK), Myc/DDK-tagged full-length human CXCR4 S324A protein (CXCR4-S324A-Myc/DDK), or Myc/DDK-tagged full-length human CXCR4 S325A protein (CXCR4-S325A-Myc/DDK), using Phospho-CXCR4 (Ser339) Antibody (upper), Myc-Tag (71D10) Rabbit mAb #2278 (middle), and β-actin (D6A8) Rabbit mAb #8457 (lower). 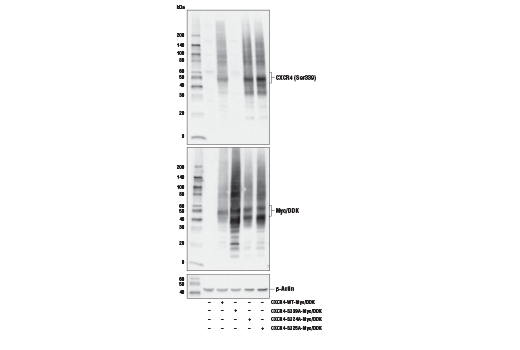 Western blot analysis of extracts from MOLT-4 cells, untreated (-) or treated (+) with combinations of the following treatments as indicated: CXCL12 (100 nM, 10 min), λ-phosphatase, using Phospho-CXCR4 (Ser339) Antibody (upper) and β-actin (D6A8) Rabbit mAb #8457 (lower). Phospho-CXCR4 (Ser339) Antibody recognizes endogenous levels of CXCR4 protein only when phosphorylated at Ser339. 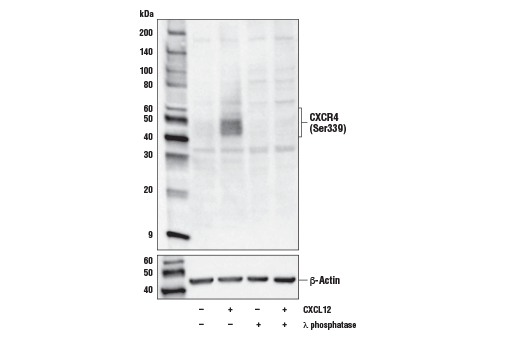 This antibody does not cross-react with CXCR4 protein when phosphorylated at Ser324 or Ser325. Polyclonal antibodies are produced by immunizing animals with a synthetic phosphopeptide corresponding to residues surrounding Ser339 of human CXCR4 protein. Antibodies are purified by protein A and peptide affinity chromatography. CXCR4 is a chemokine receptor that belongs to the G protein-coupled receptor family. It is activated by a small cytokine, CXCL12, also known as stromal cell derived factor 1 (SDF-1) (1). The main function of CXCR4 is the mediation of the homing of progenitor cells in the bone marrow and their recruitment to sites of injury (2). More recently, CXCR4 has been studied, as a potential therapeutic target, in the context of autoimmune diseases (3) as well as cancer, as the receptor is involved in the regulation of migration, proliferation, and survival of cancer cells (4). CXCR4 is phosphorylated at Ser339 by G protein-coupled receptor kinase 6 upon treatment of cells with CXCL12 (5). Phosphorylation of CXCR4 at Ser339 has also been observed following epidermal growth factor and phorbol ester treatment (6). TCR-mediated transactivation of CXCR4 at Ser339 activates a PREX1-Rac1-signaling pathway that stabilizes interleukin-2, -4, and -10 messenger RNA transcripts (7). Blanchet, X. et al. (2012) Front Immunol 3, 175. Döring, Y. et al. (2014) Front Physiol 5, 212. Debnath, B. et al. (2013) Theranostics 3, 47-75. Teicher, B.A. and Fricker, S.P. (2010) Clin Cancer Res 16, 2927-31. Busillo, J.M. et al. (2010) J Biol Chem 285, 7805-17. Woerner, B.M. et al. (2005) Cancer Res 65, 11392-9. Kremer, K.N. et al. (2017) Blood 130, 982-994.